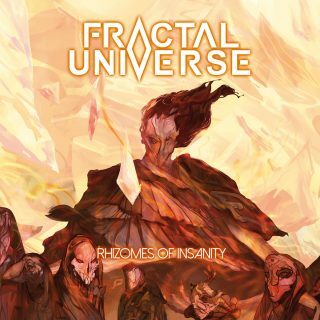 Fractal Universe : Rhizomes Of Insanity album download | Has it Leaked? On April 19th, Fractal Universe will release their new album, Rhizomes of Insanity, via Metal Blade Records. In anticipation of this release, the band has launched a video for the record’s first single, “Oneiric Realisations”. Fractal Universe‘s sophomore full-length, Rhizomes of Insanity, hits as hard intellectually as it does sonically, affirming the French quartet’s place on the progressive death metal map. “‘Rhizomes of Insanity‘ is a concept album based on a thought experiment around the concept of insanity,” asserts vocalist/guitarist Vince Wilquin. “It questions the origins of it, and tries to define where we set its boundaries with ‘reason’. It eventually questions its place in our modern society and surmises that it has turned into an intrinsic, unavoidable but also necessary part of it and of every human being, which we’re trying to repress at all costs.” From start to finish, the album is an immersive, complex yet wholly accessible collection rich in melody, invention, and packed with decimating riffs – wielding ten tracks, all of which hit their mark.